Media and society have trained us to believe that having a baby is a very expensive undertaking. And it totally can be, but it can also not be that bad. Yes, there are some costs that are necessary, like childcare. But I’ve found that we also save in many other ways. For example, we rarely go out to eat anymore because dining with a 16-month-old is like herding a wild boar in a china shop. Marketers know that parents will do anything for their children to ensure the best for them, and they feed into these insecurities. As parents, we are constantly being bombarded with marketing that triggers these feelings, the need to buy things for our children so that they grow up to be compassionate and well-rounded adults. We don’t have to feed into the hype. 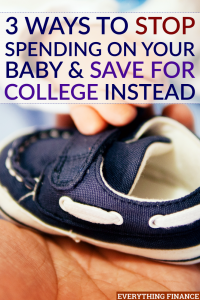 Here are three ways we’ve stopped spending on our baby, and are saving for college instead. Parents, and first-time parents especially, are bombarded with extracurricular activities they should be participating in with their young spawn. Music classes, paint classes, gymboree, they even have soccer for 18-month-olds! Now tell me, what does a soccer class for an 18-month-old look like exactly? These classes aren’t cheap either. I signed up my son for a six-week 30-minute music class that cost me $90. I spent half the class trying to wrangle him to sit down, and the other half of the class following him around as he banged on drums and xylophones. Complete waste of money. Now we use that to save for college instead. Before we had a baby, we’d go to restaurants almost weekly. Sometimes even twice in one week. These days, we’re lucky if we dine out once a month. Dining with a toddler, especially one as active as ours, is nearly impossible. The amount of money we’re saving on restaurant dining is a big source for funding our son’s college savings account. As first-time parents, we were excited to throw our son a huge first birthday party that included all 75 of our closest family and friends (we have big families). The birthday was a hit and everyone, our son included, had a great time. BUT, and here’s the big but, the party was really for us, and not for our kid. It was our way of celebrating that we survived our first year of parenthood. Which is a huge milestone, and I don’t blame ourselves for wanting to celebrate. But that’s it. The big birthday bashes end here. In the future, we’ll be hosting small gatherings (if any, at all) until our son reaches an age that he can specifically request what he would like for his birthday. Parties can easily cost $500+ these days, and I’d rather to save for college for the little guy instead. Because the best gift we could ever possibly give him is the gift of graduating college debt-free. Are you saving for your kids’ college fund? How are you finding money to save for college?